In my younger years, I believed everything my dad told me about food. I believed him when he told me that if I ate a watermelon seed, a watermelon tree would grow in my stomach. I believed him when he told me that every time I swallowed a piece of gum, it would stick to the wad of 4,238 other pieces that had amassed in my system and stay there for seven years exactly. I believed him when he told me that sweetened Farina and macaroni and cheese and Fig Newtons are a few of God’s gifts to us humans (we even made our own theme songs to celebrate our love for them). I believed him when he told me that eating beef was the only way to make an upset tummy feel better. 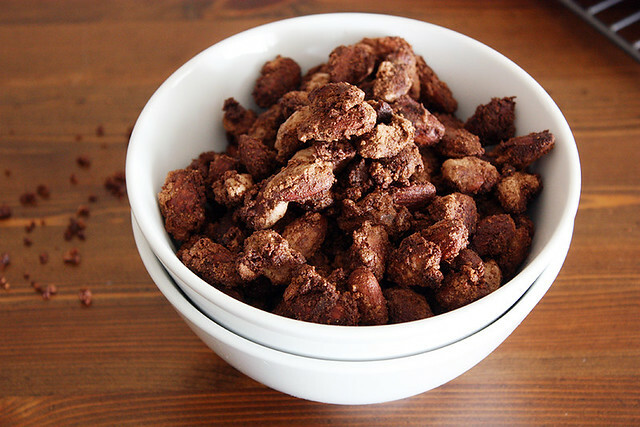 There was one thing he missed, though, which is that almonds, when tossed with cocoa and chili powder and sugar and butter and baked, are some of the most delicious things ever created. And that they, too, soothe an upset stomach — and just about anything else (like an aggressive sweet tooth or snack hankering). I’ve always been a bit of an almond fiend. At any given time, like a squirrel, I have several stashes hoarded away in either my car, my desk drawer, my lunchbox, my coat pocket, my pantry or all of the above. And there is always backup in my baking cabinets. I suspect that if and when a zombie apocalypse occurs, I’ll be OK for at least a little while because I’ll have my almonds. and discover, for the very first time, that such a thing as crunchy cocoa roasted almonds exists. Once you are burdened (read: enlightened) with that knowledge, there is no going back. Ladies and gentlefolk, these almonds? Ohmahgoodness, they are scrumptious. They’re crunchy, toasty and chocolatey with just a hint of chipotle chili kick. It’s kind of the weirdest process to make them and at first you might wonder just what, exactly, will come of this mess but I assure you — keep going. Because once you declare these almonds done and let them cool completely (or in my case, for five seconds before shoveling a piping-hot handful directly into my mouth hole: Do. Not. Recommend.) and give them a taste, you will understand what was going on all along — magic. Magic was going on all along. And it’s here to stay — at least until you finish your newfangled stash of almonds (which, in my case, was approximately 48 hours). I suspect my stomach is now completely full of cocoa-roasted almonds. And, of course, a wad of bubble gum. Preheat oven to 350 degrees F. Spread almonds in a single layer on a rimmed baking sheet. 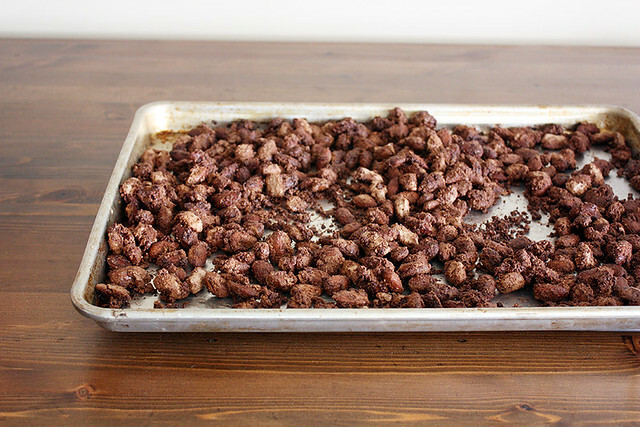 Roast almonds for 15 minutes, then remove from oven and transfer to a large bowl to cool completely. Place butter on rimmed baking sheet; return to oven until butter is melted, about 5-7 minutes. Remove from oven and set aside. In a large bowl or bowl of a stand mixer, whisk egg whites and 1/2 teaspoon salt on medium speed until egg whites are frothy. Gradually add sugar. 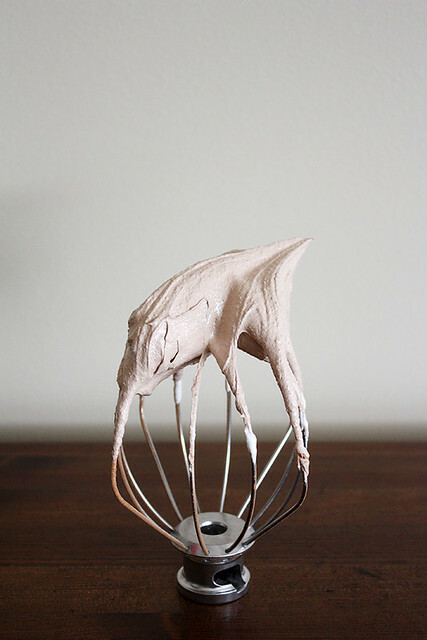 Increase speed to medium high and whisk until egg whites begin to form stiff peaks. Add remaining 1/2 teaspoon salt, cocoa powder and chili powder and whisk until well combined. 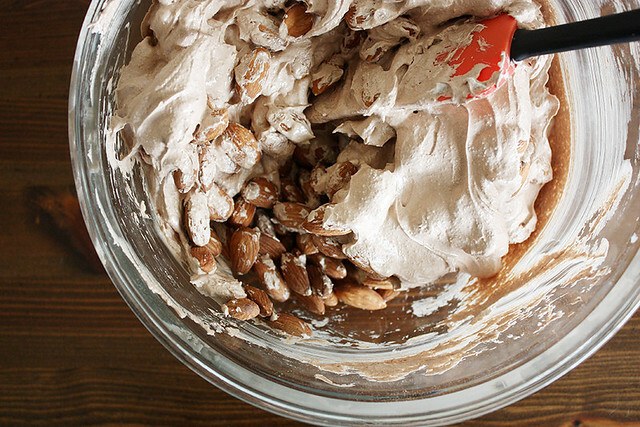 Pour egg white mixture over cooled almonds and stir to combine. Spread almond mixture in a single layer over melted butter on baking sheet. Return to oven and bake 30-40 minutes, stirring almonds every 10 minutes, until done. Remove from oven and let cool completely. 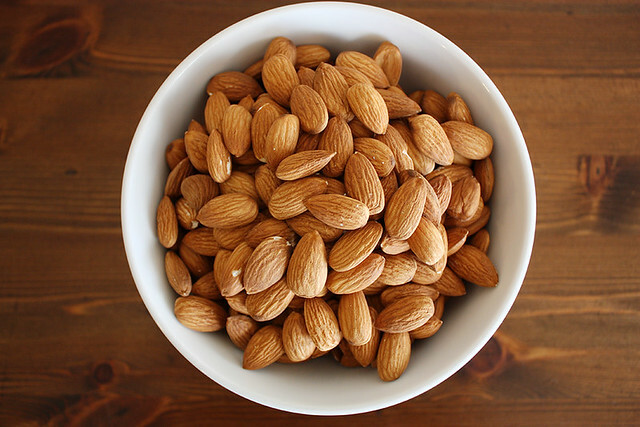 Almonds will stay fresh in an airtight container at room temperature for up to 1 week. Oh my good God I want these right now. Just leaving work and making a swift detour to pick up almonds. 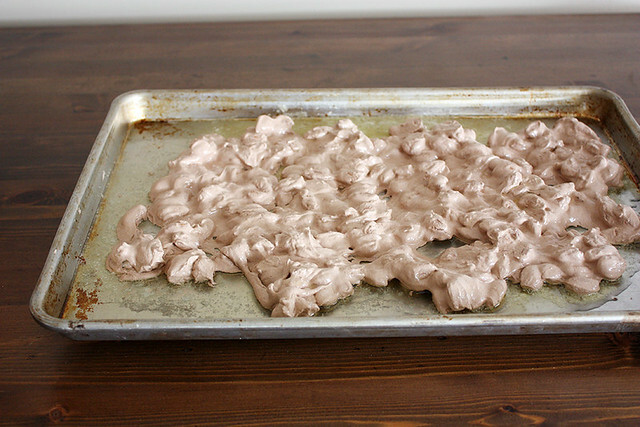 Wow, I love the transformation of the meringue after you bake it. Yum! 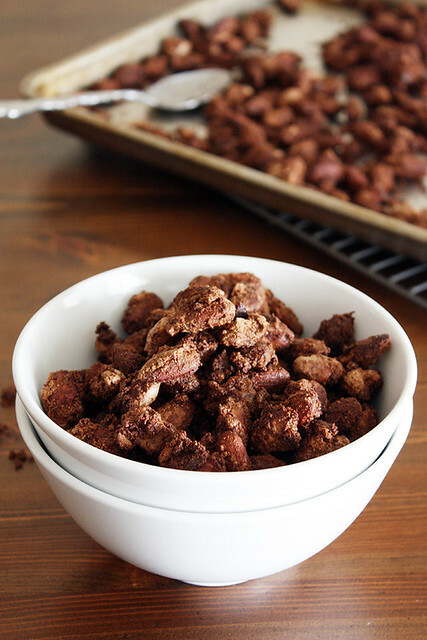 I la la la loooove roasted almonds and I bet the cocoa/chili combo is amazing! Your dad sounds like a pretty smart guy…he deserves some of these roasted almonds! A favorite of my dad’s is that eating broccoli will make my hair curly (epic. fail.) oh well. I used to buy these in the store already made, b/c I had no idea you could make them. derp. Love this recipe! Claire — Oh yes, you can make them at home and they’re just as tasty 🙂 Thanks for the comment! These definitely look magical! Yum! Oh wow. The combination of the cocoa and chili sounds delicious!!!! Love your blog! a farmer in the dell — Thank you so much! Hannah — I’ve never had the storebought kind but I have to say, these are pretty tasty 🙂 Thanks for the comment! Haha….for years and years I believed if I accidentally ate fruit seeds, I’d have a garden growing in my stomach! These almonds look nothing short of delicious and amazing! Kelli — Glad I’m not the only one who grew up with that fear! 😉 Thanks for the comment! Isn’t that funny that we used to believe everything our parents said, until puberty, and then we believe nothing. My dad used to tell me that he was a doctor, just so he could gain my trust enough to pull out splinters and teeth. Those almonds look absolutely amazing. i snack on almonds just about every day and can’t believe that I’ve never thought to choc-ify them! I mean…what better way to satisfy two cravings at once? Why have I never made these before?? 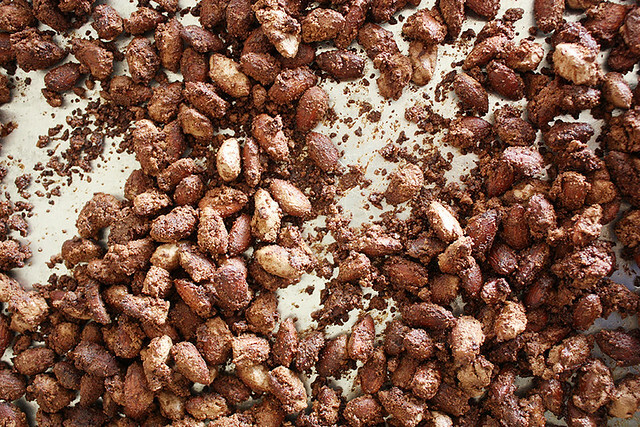 Cocoa roasted almonds are the best. And I love how creamy/fluffy they look prebake! Natasha — They are SO good. I’d never made them before this, either, but now I can’t get enough of them! Thanks for the comment! These almonds look fab! Wish I had a handful for my afternoon snack :). Karen — Welcome, and thanks! I haven’t made them with less or brown sugar, though I’m sure you could do either and they would still be delicious. 🙂 Hope you like them! YUM!! Do you suppose you could just start with roasted almonds and skip the first step? What a great idea! I do like the sweet-&-spicy almonds Cynthia Barcomi has in her book, but your version sounds great, too. Thanks! Are these almonds sticky and/or oily to the touch when done? I’m looking for a new snack to make for a game day party, and these sound and look really interesting! Benita, I don’t think so! They’re fairly dry when done.